The boss of a thriving Teesside business admits he still relies on “immensely important” legal advice after 26 years in business. Middlesbrough-based Industrial Technology Systems (ITS) was formed in 1991 and currently employs 58 employees across two sites – the other being in Warrington, Cheshire. 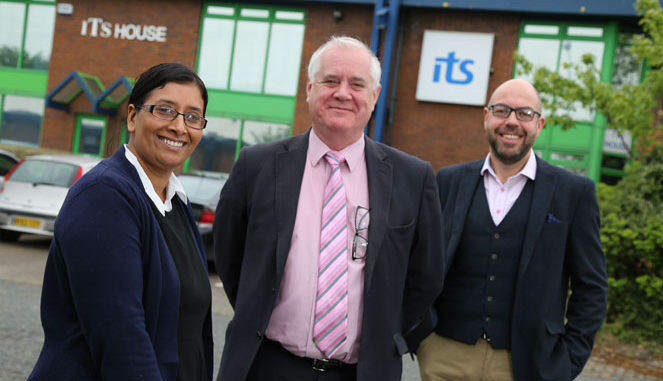 Managing director Malcolm Knott – pictured (above, centre) with Endeavour Partnership’s head of commercial disputes Lee Bramley and employment lawyer Nazia Aftab – first used law firm Endeavour Partnership when he bought out his business partner in 2001. Sixteen years later, and Malcolm continues to rely on all areas of Endeavour’s experienced team for issues covering commercial property, employment law, disputes and resolution. “HR and employment law is constantly changing and it can be a minefield,” says Malcolm. “I struggle to get my head around employment law sometimes, so that guidance is immensely important. “We make sure we do the right thing, but every now and again we need to be reminded of certain changes in laws, and make sure we’re up to scratch with it. “The great thing about Endeavour is that if we have a legal, HR or commercial issue we can pick up the phone, so it’s very much an extension of the company. ITS, based on Riverside Park Industrial Estate, recruited five new staff last year and has already taken on another six this year, with plans to employ another three in the coming months. And with its team expected to grow to over 65, HR advice continues to play a crucial role. Endeavour Partnership’s employment and HR lawyer Nazia Aftab has been working closely with ITS. “Malcolm has been making great use of our Navigate HR system, which is an monthly discounted and cost efficient employment package offering e-mail guidance and telephone guidance,” said Nazia. “We pride ourselves on the fact you get a fast more or less immediate service, but more importantly we understand the personalities within our clients’ businesses, so we know how they’d want to respond to certain matters. ITS is an independent automation systems integrator which is split into five business areas, including management information systems, process control systems, regulatory compliance services, project management and engineering services and vision systems. Due to the variety of complex engineering process systems the firm deals with, ITS has benefited from Endeavour’s experienced team. Endeavour has the biggest employment team on Teesside, which is made up of partner Stephen Elliott, Associates Nazia Aftab and Catherine Devereux, Solicitor Laura Kirkpatrick and Trainee SolicitorJessica Maine. But the Stockton-based law firm, which was formed in 1999, also has a team of experts in a variety of areas including commercial disputes, employment, corporate recovery and insolvency, commercial property and corporate law. Lee Bramley, Endeavour’s head of commercial disputes, said: “ITS is one of our bedrock clients who has benefitted from our vast legal knowledge across the team.